Do you need a lot of power in a short amount of time? At just nine pounds and a little over a foot long, the Ramsond SunRay is a great choice. It can easily power a laptop or television or even get your furnace blower going. 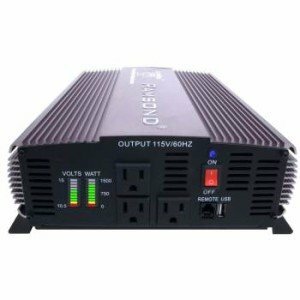 Whatever you need it for, this amazing inverter will not let you down (with 1500 watts to boot!). Just one look at the Ramsond SunRay should tell you all you need to know about the kind of power it can supply. This isn’t some small-time inverter that can barely push wattage. The pure sine wave DC to AC inverter goes from 12 volts to 115 volts. It can put out 1,500 watts of continuous power or hit a 3,000 watt surge. Aside from all the power it packs, there are a number of features worth getting excited about when it comes to this unit. For one thing, you get three three-pronged outlets, so you can support plenty of devices all at the same time. It’s also great that this inverter has a USB charging port on it too. We noticed that this is quite innovative compared to some other models we tested which have just two outlets and no USB (such as certain Power Bright or Xantrax PROwatt models). Thanks to the built-in cooling fan, though, you don’t have to worry about power demands overheating the unit or otherwise causing problems. Its thermostat controlled so it knows exactly when to go off. Plus it has safeguards for overload, over voltage, under voltage and overheating, plus automatic recovery. Some manufacturers seem to make inverters that can’t handle their own supply of power, that’s definitely not the case here. It doesn’t hurt that they made this unit with three high speed fans that start blowing immediately so temperatures are brought down to safe levels in a flash. The LED display on this machine lets you know input volts as well as output power whenever you’re operating. A nifty feature! Another awesome feature with this inverter is that it has a remoter starter port if you want it. This optional feature means you can hook up any device you want and get it going while you’re elsewhere. It would be a shame if all these awesome features came in anything other than a protective shell that could put up with some wear and tear. Fortunately, you’ll never have to worry about that. The Ramsond SunRay has a high quality aluminum exterior featuring ruffled cooling fins. From all our testing, we can tell you that this is a durable unit! Shop around and you’ll find that similar units to this one often go for somewhere around $500 and a lot of people seem happy to pay that price for all the benefits. Fortunately, you can find the Ramsond SunRay on Amazon for less than $300. That’s a lot of money saved or a lot of cash put toward another great gadget you can power through this inverter. So if you’re in the market for an inverter, it’s hard to recommend any device more than this one. When you consider how much more it could retail for, this model becomes a no-brainer. Did you skip reading this review and went straight to the bottom? Go up and read the features before clicking further, it won’t be a waste of time!